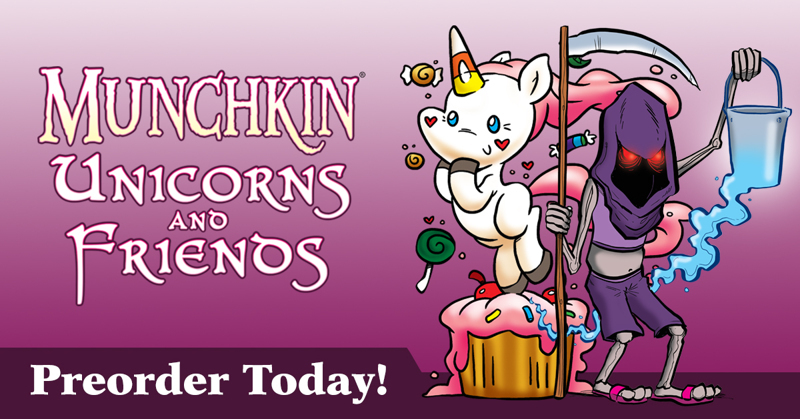 Daily Illuminator: Preorder Munchkin Unicorns Today! August 15, 2018: Preorder Munchkin Unicorns Today! Get a heaping helping of rainbows and cuteness with Munchkin Unicorns! This Kickstarter success is now available to preorder via BackerKit, along with some thematic add-ons to go with the new mini-expansion. With the stretch goals, Munchkin Unicorns was able to grow into something much bigger, including its own Boxes of Holding and Kill-O-Meter! Since the mini-expansion features art from Katy Cook, Ian McGinty, and Len Peralta, we decided to include some optional add-ons featuring their art! You can get a combo pack of Katie's Munchkin Kittens and Munchkin Puppies, throw in a copy of Len's Munchkin Clowns, or even Ian's brand-new Munchkin Side Quests. Retailer levels are also available through BackerKit for stores looking to stock a quantity of the game (and we do check to make sure you are a physical store). Quantities for some add-ons are limited, so make sure you hoof it over to BackerKit and preorder now!